Dr. Upton, D.D.S., M.S., Ph.D, P.A. Dr. Upton grew up in Centreville, Virginia. He graduated from the Virginia Military Institute with B.S. in biology in 1971 and then earned his M.S. in microbiology and D.D.S. degree from the Medical College of Virginia in 1975. He completed OMFS training at the University of North Carolina and earned a Ph.D in experimental pathology in 1981. Dr. Upton has been in private practice in Raleigh, NC since 1981. He practices a full scope of oral and maxillofacial surgery but focuses in oral pathology dentoalveolar surgery including tooth removal, dental implant placement, and reconstructive jaw surgery. Dr. Upton is a diplomat of the American Board of Oral and Maxillofacial Surgery and a fellow of the American Association of Oral and Maxillofacial Surgeons. He is an active member of the American Dental Association, North Carolina Dental Society, and American Society of Microbiology. Dr. Upton is currently on the medical staff at Rex Hospital in Raleigh, North Carolina. Dr. Upton is an adjunct assistant professor at UNC School of Dentistry in Chapel Hill. Dr. Upton and his wife Nancy, have two children (Elizabeth and Richard). In his spare time, Dr. Upton enjoys US swimming referee, gardening, and spending time w/family. © 2011. 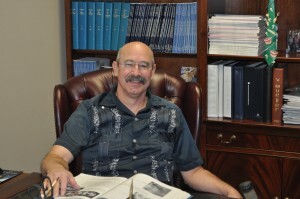 Dr. Gerald Upton, D.D.S.